In this article, we’ll review the benefits and perspectives of learning Java and probably the best way to master programming in it – through gamified education. Why Java is a smart choice for starting a career in programming? Skeptics say, that this language is too old, and will become rudimental in no longer than 20 years. It’s true, that age matters in a fast-changing programming ecosystem. But this is not the case for Java. Let’s think about key aspects for anyone who wants to build a career in programming from “ground zero”. It is important to choose a language which is easy to learn, which is widely used, especially in top-level enterprises, ensuring a wide choice of vacancies and a good scope of work. Of course, high salaries and prospects for further development are also important. Does Java meet these requirements? You bet. Java is among all-time leaders according to major rankings of programming languages. According to the TIOBE Programming Community index, Java is a #1 language based on data from 25+ search engines. It has been on top of the list since 2002, rarely losing to C language. What’s more, a couple of years ago Oracle estimated that Java runs on over 3 billion devices worldwide, thanks to its core advantage: ”write once, run everywhere”. Java is the main programming language for Android apps. It is also used in writing back-end systems and desktop applications. It is popular in numerous fields, like tech, government, finance, education, healthcare, e-commerce. Approximately 90% of Fortune 500 enterprises use Java, empathizing its security, flexibility, and simplicity for beginners. So there is no surprise that according to Indeed.com ranking, Java developer’s average salary exceeds $ 100 000 per year. Apart from this, Java has a great community. There are about 10 millions of Java developers worldwide. And if you ask them, what do they like in Java apart from the above-listed benefits, they’d probably say a wide range of excellent libraries that help in solving most of the problems during software development. Even coders from other “programming camps” admit this undeniable advantage. Okay, maybe it’s too early to talk about libraries, but it’s definitely a proper moment to switch from Java benefits to the available options for learning this language. 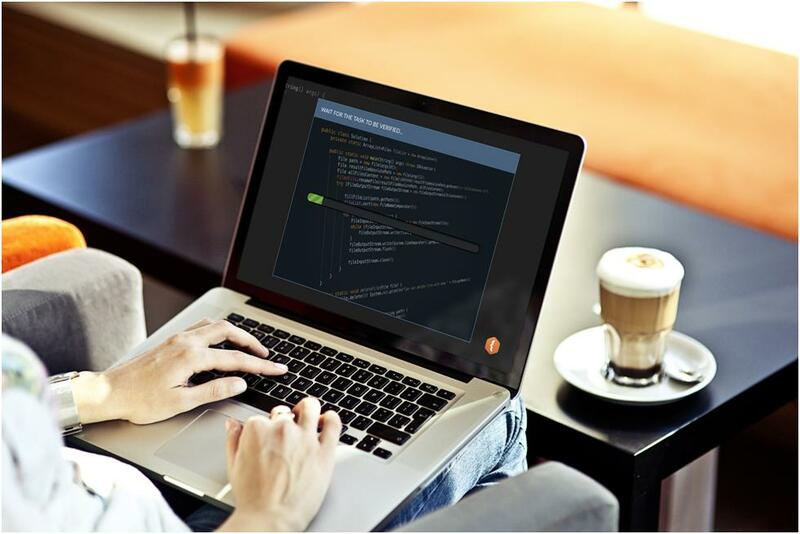 Today it’s possible to learn Java from anywhere: there’s a number of online educational platforms, which can bring you up to speed on Java programming basics. Online education includes a major element of successful learning – practice. It’s impossible to get ready for Java developer position by simply reading a few books and watching video tutorials. To become a programmer, you need to code. To stay motivated in self-education, you need an interaction. A common trend in today’s online education is gamification. And to be honest, it is the best solution for learning how to code. Let’s take CodeGym.cc as an example and delve into gamified education. CodeGym.cc is an online gamified platform, majorly based on practice. The goal is to upgrade a character by learning Java from scratch, solving tasks and opening new levels, until a student passes the final 40th. It’s like any game, with its own universe and unique story. Here’s where a player starts at CodeGym.cc. It’s the year 3018, with all futuristic attributes you can think of, like space travel, extraterrestrial life, and robots. The plot begins with a crash of spaceship Galactic Rush on the unknown planet, inhabited by wild robots. The crew needs to pull the spaceship out of the stone heap, but it is impossible without the help. They find the most talented young robot Amigo and teach him how to code so that later he will be able to rewrite his firmware for a bricklayer and then do the same with other robots. 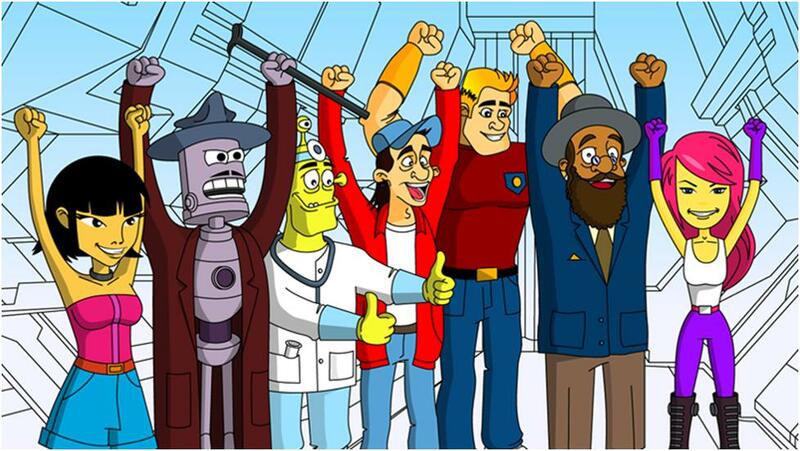 The “army” of bricklayers will take the heap to pieces and pull out the spaceship. The course is divided into four quests, each has 10 levels. Every level contains 10-12 lectures with theory, explained in an interactive, lively tone of voice and a set of tasks. The goal is to help Amigo pass the 40th level. By that time, a student (or rather say, a player) will be quite ready for Junior Java developer position. The storyline, milestones, gaming, and on-time motivation are supposed to help a user to reach the end. In CodeGym the emphasis is put on practice: there are 1200+ tasks, which convert into more than 500 hours of programming. This is exactly what a student needs to apply for the first job in programming. Learning Java is impossible without practicing at once. Therefore, almost every lecture ends with the tasks of different complexity. Each task has an instant verification option, that shows a user’s progress step by step. That’s why it is possible to leave the correct lines of code and focus on fixing mistakes. After the task is fully completed, a student can see a detailed review of it: statistics on the average number of attempts taken in, comparison with other students. Given that almost every task starting from level 3 can have multiple solutions, a student can return and complete them again. 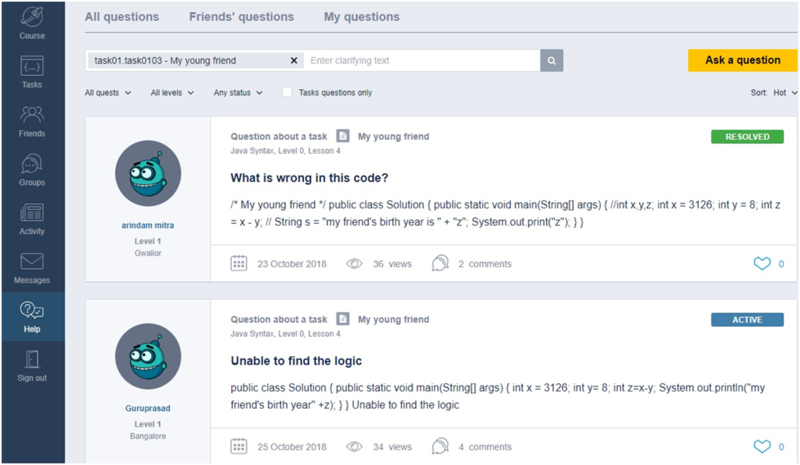 To improve code, open the “Code analysis” tab to see the tips from a virtual mentor, which will help to improve a coding style. CodeGym.cc course includes approximately 80% of practice and 20% of theory. Sometimes the tasks outrun theory so that a student needs to do extra research or take more time to solve the task. But if it’s too hard to resolve, one can ask for a help from CodeGym.cc community. There’s a great chance that someone will give a tip, which will lead to the right solution. CodeGym.cc is a course with an integral approach to education. The story and challenges lead students further. 1200+ tasks ensure hundreds of hours of coding. Fast-growing community helps to improve programming skills by sharing the experience. So, if you’re into learning Java, you might want to do it in an uncommon, but efficient way.